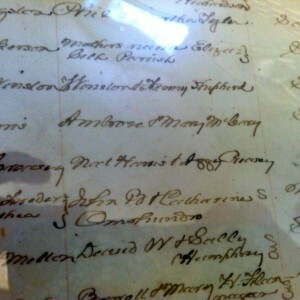 The Names of Parents in Historical Marriage Records of Fluvanna Co. In the days before I married and then after I divorced, my name became contentious to me. . . do I keep mine and not take his? Do I keep his and not re-take mine? I didn’t and I didn’t. I took his name on, and then I gave it back. Both acts changed me, shaped me, scarred me even. As I scroll through pages and pages of marriage records, I’m watching for surnames, for the family names I know – Creasy, Skipwith, Gault, Tompkins – but even as I read those, my eye snags on a given name (how odd that we use that term for first names when all names are given or taken)- Isaetta. I know that name. I’ve read it a hundred times on an inventory. I practically say it as a mantra. All these names I chant, quietly, beneath my breath: Isham Gault, Letty Tompkins, Lucy Skipwith, Primus Randall, Mahala, Old Pompey, Aggy, Berthier Edwards, Jesse Nicholas, Lizzie . . . they are carved into who I am now. Part of my own naming. George Smith married Ann Creasy on January 6, 1887. George was 35, and Ann was 40. George’s parents were Jessie and Mattie Smith. Ann’s parents – unknown. In the same index that lists George and Ann’s marriage, I find my own – Andrea Dawn Cumbo to “my former husband.” My parents are listed, as are his. We are recorded and tied back to history and each other. Today, when people here talk about the black Bowles and the white Bowles, or the black Paces and the white Paces, they speak as if these people have no kinship . . . but their names, in a small place like this, tell a different story. Sometimes parents aren’t always unknown. Sometimes they are secret. I don’t think much about my name, but then, except for those two brief periods around my marriage, I never had to. I have always known my name. I have always known my people. I have always known to whom I belong and that no one owns me. Isaetta, Mahala, Isham, Aggy – they did not always know. They did not always get to choose their names, at least not publicly. But when they did choose – in the softness of the evening by their fires as the words of Emancipation spread from plantation to plantation – I wonder what they considered when they knew that, for the first time, they would name themselves legally. Did they consider the cache and legacy of taking (or keeping) the master’s name? Did they wish for names long lost to other tongues and buried in culture swept away by the influences of another? Or did they dream wild, free dreams of names that spoke of the hope deferred? Justice, Freedom, Phoenix . . . before they settled back to Johnson, Randall, Smith? I like to imagine Primus and his family sat by the fire and laughed long and loud with the glory of their naming. I hope so.